千手螺 Thousand Arm Snail. I have only ever seen these in Jin Men. The lower portion (the "fingers") are hard, while the upper black part is sort off crunchy. You can either bite through the crunchy parts to get to the softer snail inside, or pry open the hard lower part and pull out the inside. 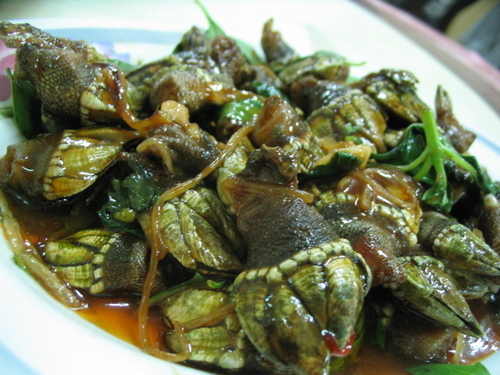 The snails are stir-fried in a basil sauce similar to San Bei Ji (three cups chicken) sauce.